My family: (L-R) Me, Baby Girl, and my husband, Shawn Taylor. Throughout June and July, I put gas in my car, did laundry, pulled some weeds, went swimming, took a road trip to LA, made kik alicha, samgyetang, and raspberry-lemon curd muffins for the first time, drove my daughter to camp and art class, went to the movies, ate my favorite ice cream, and my husband and I celebrated our thirteenth anniversary. Doing the things I love, and the things that need to be done bring a sense of stability and contentment to my life. They provide me with something I can look forward to, something to hold on to. They have predictable outcomes: I know when I put gas in my car, it will take me where I need to go; when I cook and bake, I know I will feel happy. To me, the certainty signals normalcy. But things are not normal for us as a family right now. News of Black people getting killed is not just news. It’s worry. It’s fear. It’s pain. As if the police killings of unarmed Black men and women over the last decade weren’t enough, hearing more about us being beaten, killed, chased out, and imitated during the months of June and July pushed me into a place where I refused to feel. After each new incident, once the numbness subsided, I was scared first and cried later. Anger came but was cut short by a new incident, and once again, I was reluctant to feel. Nonstop. One after the next. And this is just a sample of events in June and July impacting Black folks. 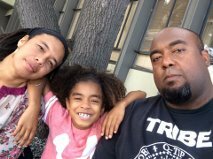 Two days before Dajerria was thrown to the ground, a Black boy around twelve gets his face slammed into the ground in Albany, CA by two white police officers when his skateboard slips out from under him and hits the rear passenger tire of their cop car. My husband witnessed the whole thing and came over to the officers, attempting to explain. One of the officers unsnapped the holster to his pistol, threatened my husband and then asked him if he “wanted some.” Luckily, two other Albany police officers approached, one of whom my husband happened to know. My husband explained to the officer what had just taken place. This officer then released both my husband and the boy. My husband, our daughter, and I stood in our home that night, crying as we held each other, thankful that Daddy was still alive. My husband and I agreed we could not stay here. Though he and I understood that “here” meant this country, we were unclear if there existed a place we could escape to and actually be safe. Safe. Safe is a funny word. I can feel safe and yet be in serious danger. This is what disturbs me so deeply about the nine murdered in Charleston. I’m sure they felt safe in Emanuel A.M.E. Church during their Bible study meeting. A worship space rightfully should be a congregation’s sanctuary, not it’s death chamber. I don’t like that gap between perception and reality, but it’s always there. I stopped wearing a hoody while jogging in my neighborhood. I keep a close eye on my husband if he goes into a gas station alone just to make sure he is safe. I ask my husband not to go out alone after dark (not even in our driveway). I notice myself thinking twice before attending an event with a predominantly Black audience/congregation/etc. in fear that we could be a target of violence. If organizing an event drawing a Black audience, I think twice about publicly disclosing location/time in the interest of protecting audience from potential harm. All these things are done in an attempt to lessen the likelihood that I or the people I care about will become targets of violence—meager, nearly futile exercises in self-preservation that don’t guarantee safety when faced with the unpredictable movement of racial hatred. The violent acts we have witnessed have effectively instilled fear in our Black families, our Black communities. They are terrorist acts. Acts of terrorism gradually twist the minds of its targets, making us search for ways to change our behavior in order to remain safe; truly, the perpetrators and the systems that sustain, support, and protect them need to change. 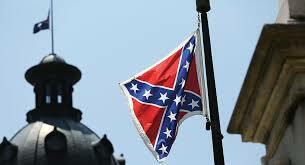 The Confederate flag at a Confederate memorial on the Capitol grounds in Columbia, SC. Officially removed July 10, 2015. White supremacy (overt and covert) is building momentum and becoming more brazen. As more Black folk are killed due to white racial hatred (of those who are white and those who pass as white), the truth that we do not live in a post-racial society becomes loud and clear for those long in denial. At the same time, these incidents seem to inspire and embolden white supremacists to continue to unleash and act upon more of their racist rage. With each week that passes, I wonder what will happen next. Who will be the next to die? When will they stop killing us? Please understand: I don’t sit in my livingroom all day, everyday, rocking back and forth, wondering if I might die. I am not crippled by the fear, but I’m certainly stifled by it. The fear lingers in the background while I put gas in my car, do laundry, pull weeds, cook, bake, work, eat, sleep, and pray. To Black parents on Earth, all I can say for now is, at minimum, we need to equip ourselves with self-defense skills, as well as, negotiation and de-escalation techniques. Of course, these skills are no substitute for the essential changes in legislation and the criminal justice system that must be made to ensure that the human value and dignity of African Americans is recognized, respected, and protected in the first place. There’s also no guarantee that such skills will save us from being shot in the back or having our house or church set on fire. However, these are skills we can acquire now to increase our chances of survival in situations where we are unprotected by the authorities—an ugly reality of Black life in the United States. To Black parents planning to visit Earth, it is not safe for you to come here. Not now. Lauren Zakalik, “Texas Police Officer in Pool Party Video Identified,” USA Today, June 9, 2015, http://www.usatoday.com/story/news/nation/2015/06/08/texas-police-officer-reaction-pool-party/28673177/. See also Tom Cleary, “Dajerria Becton: 5 Fast Facts You Need to Know,” Heavy, June 8, 2015, http://heavy.com/news/2015/06/dajerria-becton-mckinney-texas-black-girl-bikini-name-assaulted-video-photo-interview-friends-eric-casebolt/. Zeba Blay “Why Comparing Rachel Dolezal to Kaitlyn Jenner is Detrimental to Trans and Racial Progress,” Huffington Post, June 12, 2015, http://www.huffingtonpost.com/2015/06/12/rachel-dolezal-caitlyn-jenner_n_7569160.html. Jessica Simeone, Tasneem Nashrulla, Ema O’Connor, and Tamerra Griffin, “These are the Victims of the Charleston Church Shooting,” BuzzFeed News, June 18, 2015, http://www.buzzfeed.com/jessicasimeone/these-are-the-victims-of-the-charleston-church-shooting#.tf24PjP0E. Roxanna Altholz and Laurel E. Fletcher, “The Dominican Republic Must Stop Expulsions of Haitians,” New York Times, July 5, 2015, http://www.nytimes.com/2015/07/06/opinion/the-dominican-republic-must-stop-expulsions-of-haitians.html. See also Leah Libresco, The Dominican Republic’s Revocation of Citizenship Creates 200,000 Stateless People, Five Thirty Eight, June 17, 2015, http://fivethirtyeight.com/datalab/the-dominican-republics-revocation-of-citizenship-creates-200000-stateless-people/; Esther Yu-Hsi Lee, “Dominican Republic Revokes Citizenship for Haitian Children,” Think Progress, September 30, 2013, http://thinkprogress.org/immigration/2013/09/30/2693951/dominican-republic-revoke-citizenship/. Alissa Greenberg, “Another Black Church Burns in the South, the 8th in 10 Days,” Time, July 1, 2015, http://time.com/3942688/black-church-burning-mount-zion-ame-south-carolina/. David Montgomery, “Sandra Bland was Threatened with Taser Police Video Shows,” New York Times, July 21,2015, http://www.nytimes.com/2015/07/22/us/sandra-bland-was-combative-texas-arrest-report-says.html. Oh my oh my oh my. Janet, these are some of my sentiments exactly. I am struggling through story after story of black skin being target practice by white officers of the “law”. I teeter between hope and despair so much and I sometimes feel my work is not enough and have to convince myself that it is. I just sent a friend a text, JUST BEFORE I READ THIS, that I just have to go somewhere far away, to do a white bath, to breathe, to affirm my own life again, so that I might be able to help affirm others. This is a hard hard time and the tremendous Oakland sunshine seems to mock the very light that suffocates within me. Too much death without cause or proper order. Too much loss. Too much fear. Too much violence. Too much stagnation. Too much of the worse and too fleeting seem the good things. This is probably a ramble but it’s what I have in this moment. Thank you for this newsletter. I’d love to join forces somehow, sooner than later.